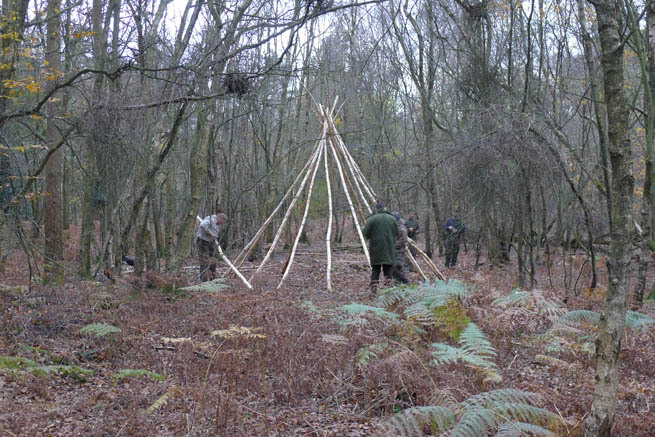 A tarp tipi shelter built on a Frontier Bushcraft course. Photo: Paul Kirtley. A large tarp creates a fantastic communal space while camping in the woods. It's quick and easy to erect. A mainstay of many bushcraft camping outfits, a tarp provides shelter from rain and space to work in. You can have a fire underneath a tarp with which you can warm up, dry off your clothes and cook upon. In the warmer months of the year, this is all the shelter you need and, for many, the preferred way to live in the woods. A great alternative for the winter months is a tarp tipi. It takes a little while to build but, once erected, provides a sheltered space that is easy to warm with a small fire. You burn much less firewood than staying warm under a tarp and in this respect alone, the tarp tipi shelter is worth the extra effort it takes to build. You can relax in what is a warm, cosy and welcoming atmosphere. 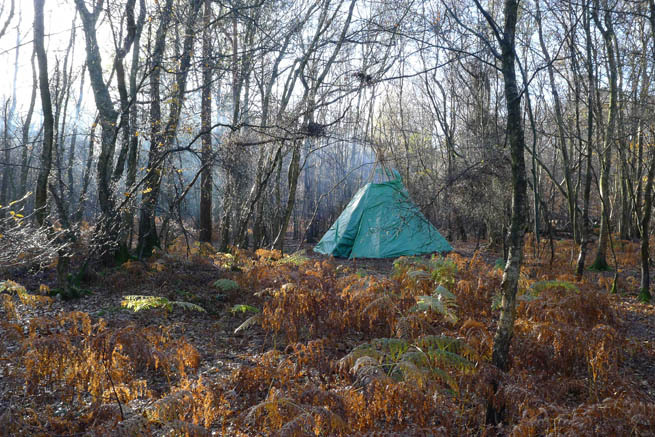 The tarp tipi shelter provides a warm, cosy and welcoming communal space. Photo: Paul Kirtley. 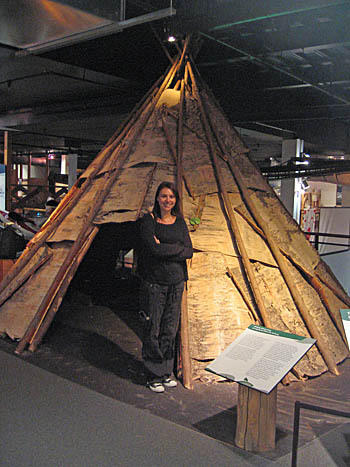 While it may be a case of misappropriation to call a conical shelter of this shape a tipi, the term tarp tipi seems to have been coined relatively recently to describe a shelter of this construction. 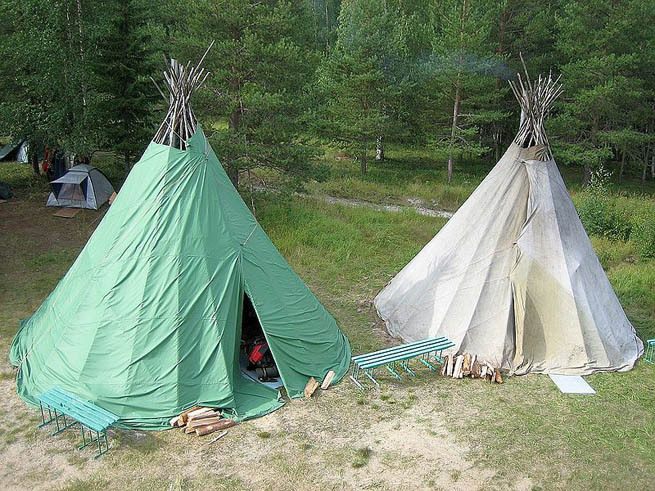 The archetypal tipi of the Plains Indians was certainly steeper than the design shown above, and in this respect the tarp tipi shows more similarity to the lavvu, one of the traditional shelters of the Sami people, indigenous to northern Scandinavia. Lavvu poles tend to be less vertical resulting in a larger ground area for a given height (and greater stability). Lunch stop on a snow machine tour in northern Sweden. Note the lavvu frame in the background. Photo: Paul Kirtley. The lavvu also bears close resemblance to the conical shelters built by First Nations in the northern parts of North America, from the Mi'kmaq in the northeast to the Tlicho in the northwest. The above photo was taken at the Canadian Canoe Museum, visited as part of our Canoe Canada: The French River trip. Other northern peoples also use a conical shelter design similar to the tipi and the lavvu. 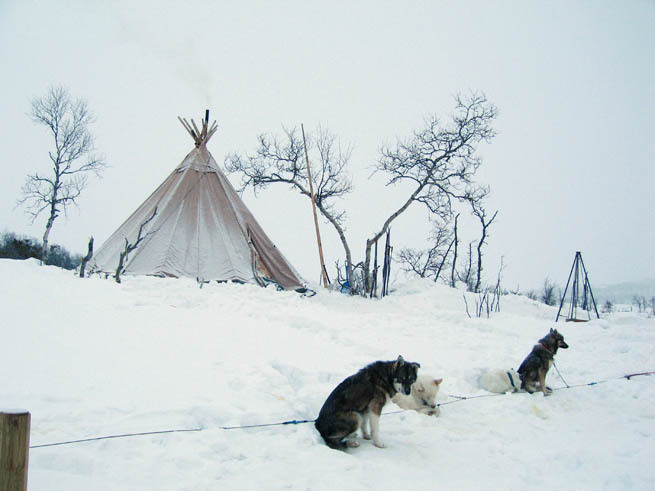 The chum is a shelter traditionally used by nomadic reindeer herders of Siberia such as the Nenets people. Chums tend to be larger in size than typical lavvu and are still used to this day. Siberian chum shelters are larger but bear close resemblance to the Scandinavian lavvu. Photo: Equanim. This style of shelter works well in the snow, being relatively easy to heat as well as shedding the snow easily. There are more modern versions of the traditional designs, utilising shaped canvas coverings and containing stoves, rather than open fires. A shelter with the traditional lavvu profile but with a shaped canvas outer, Norway. Also note the stove chimney pipe at the top. Photo: Paul Kirtley. What all of these shelters - tipi, lavvu and chum - have in common is a conical shape with a frame of long poles covered in a wind-proof material. It is within this category of classic shelter designs that the tarp tipi fits. Construction of the tarp tipi shelter takes a little while. The main effort is in collecting and preparing the poles. The poles should be selected so they are as straight as possible. Side branches and knots are removed so that there are no sharp protuberances that will damage the covering. The bark is removed. 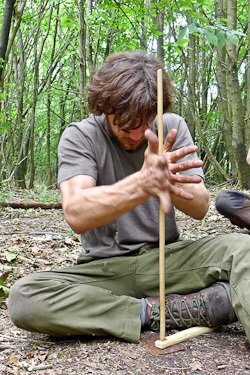 Erecting the framework for a tarp tipi on a Frontier Bushcraft course. Photo: Paul Kirtley. Once the shelter is completed, it forms a fantastic, relaxing communal space which is easy to heat with relatively little firewood. This thermal efficiency is welcomed when the nights are long and temperatures low. In addition, time spent gathering firewood during the daylight hours is reduced and resources of the forest are used more sparingly. The central fireplace makes for a great cooking area too. Pan-frying venison steaks over the central fireplace. Note the shirt sleeves and open door. Photo: Paul Kirtley. The longer autumn and winter evenings mean that you can undertake some great cooking, get comfortable and work on crafts or repair equipment and, of course, tell stories. The tarp tipi provides a warm, relaxing communal shelter. Great for conversation, jokes and story telling. Photo: Paul Kirtley. "I liked the northern forest living theme that you gave the weekend, it was a nice surprise and added to the whole experience. At one point I looked out of the door of the Lavvu, all I could see through the opening was birch and pine. It occurred to me that I could have been anywhere from Siberia to Alaska - A nice feeling when in reality we were an hour from London!" Indeed, despite the tarp tipi shelter being a modern take on a classic design, when you are inside you feel part of a long tradition. It's not only a tradition of utilising a design that has sheltered countless people around the northern hemisphere for centuries, if not millenia; it's also a tradition of community centred around the campfire and passing away the long, dark evenings by sharing stories, experiences and laughter. This is as valuable today as it has always been. 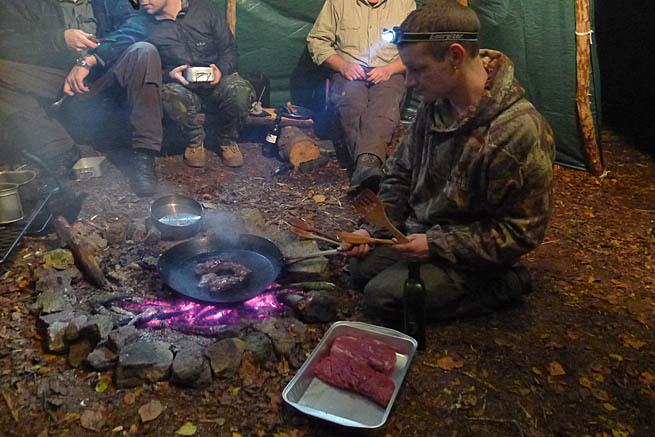 If you'd like to join us for an autumn or winter bushcraft experience, drop us a line on info@frontierbushcraft.com to find out what the options are. And if you've built or stayed in one of these shelters, let us know about your experiences in the comments section below. Thanks! Nice project. I’d like to have a go at doing one. What sort of size tarp are you using? I think these ones were 5m x 4m. We needed 3 of them, overlapping, for the tarp tipi in the picture. This isn’t necessarily the optimal size, however, just what we used on this occasion. You normally have to take what’s available in the local DIY store. You can use very large tarps but given the nature of the (mathematical) problem – covering a cone with rectangles – you end up with a lot of spare material. I was thinking about setting up some ‘lodge poles’ as you have done , but using one of my parachutes as the ‘covering’. I think that the chute I have in mind is over 4 years old and has been well and truly waterproofed by the wood smoke. Hopefully the shape of the chute will be a lot more efficient ?? While I’ve never tried your suggestion, I’ve heard it works quite well. The parachute material itself is not as waterproof as a builders tarp. But, as you say, if it is well-used as many of us use them – over a fire – then there will be a lot of resin on the inside of the canopy. This adds greatly to it’s ability to withstand a sustained downpour. 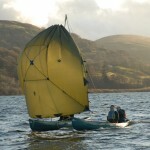 The shape of a chute certainly lends itself to the shape of a tipi or lavvu. My main concern would be the material being snagged on any rough parts of the poles. If the poles are smooth enough, however, I would imagine this will be less of a risk. Let us know how you get on with the project. You are definitely preaching to the converted when it comes to using parachutes for shelters. This is a great idea though ‘chum’ or ‘lavu’ would be more correct as this doesn’t have the ‘smokeflaps’ of a true tipi. I am concerned, however, to see that you are using nylon or plastic tarps for the covering, these can be highly flamable and shouldn’t be used with a fire inside, much better to use a canvas tarp, which is much slower to burn and can be treated with fire retardants, or better still visit my website and order a custom made tipi. Thanks for your comment. Thanks also for posting a link to your site. While I agree that canvas makes and excellent outer covering for a heated space, I disagree completely that a builders tarp “shouldn’t be used with a fire inside”. Unlike tent nylon, a builders tarp is difficult to ignite and for it to melt on a structure of the size we are discussing the fire inside would have to be very large indeed – much larger than would be bearable for anyone to remain inside the shelter. This type of structure does not need a large fire to keep it warm and there is very little risk of igniting the outer material. Canvas will also pose a fire risk if you get it hot enough and for heated tents of a conical shape or A-frame structure, you have to be careful, particularly when using stoves and chimneys. When winter camping in the northern forest you often have to maintain a 60 degree difference between the inside temperature of a tent at ground level and the ambient temperature outside. This means an air temperature at the apex of an A-frame tent of around 50-60 degrees Celsius. The stove will be very hot and the chimney will be also. Where this passes close to the canvas, care must be taken and with modern canvas tents there is often a square of incombustible material where the chimney passes through. For a conical shelter such as a tipi, chum or lavvu, with a small fire inside, I would say the risk is the same whether you are using canvas or a heavy builders tarp – very small. Either way you should have a knife to hand to cut your way straight out of the side of the shelter in case of fire. A greater concern with having a fire in any enclosed space is carbon monoxide poisoning. Whether you are using plastic, canvas or any other material, you should always make sure that ventilation is very good. Moreover, building a shelter of less than the size in the pictures above and thatching it with natural materials such as brushwood from coniferous trees creates a perfect space within which to have a fire to keep warm. Indeed we teach courses where students build such shelters and while the risk of igniting the shelter is greater than with a canvas or plastic covering, it is still a not a huge risk. A greater risk for a group stuck in wilderness would be NOT building such a shelter and succumbing to hypothermia. I’m sure your canvas tipis are fantastic but the shelter principles we teach are both sound and well-tested. The tarp-tipi pictured in the article didn’t have an adjustable vent at the top but it’s not too difficult to arrange this as long as the tarps are big enough. The easiest way is to have one, or two, long poles attached to the pieces that can be moved over the hole. These poles then just lie against the outside of the shelter, holding the flap in the position you desire. The floor of the tipi can be insulated with spruce boughs or similar. With a thick enough mattress of boughs, this can be quite comfortable to sleep upon. It also reduces conduction into the ground. Even a relatively small fire through the night can add a lot of warmth to the space. A woolen blanket, however, is very good to sleep under in this shelter arrangement. If you are keeping the fire going all night, you shouldn’t try to seal the shelter too much as it will be very smokey and there is also an increase risk from carbon monoxide poisoning. Hi, what length do you reckon the poles should be & how many do you need? Around 12-14 poles, 5m (15ft) in length. Are you planning on building a tarp-tipi? Yes, I want to do this :-). Will get it together here at home over next fews months. Not including taking the bark off the poles, maybe an hour the first time. Tie three or four of the poles together, erect them and then lay the rest against the apex. Then overlap the tarps so you have good coverage. Don’t cut them to shape as you’ll never get them back in exactly the same place next time. Just fold excess material out of the way if necessary. Ta muchley, I think I’ve got that and it makes sense. When we get to actually doing it I’ll post pix. Thinking of building a Teepee/chum with some scouts , What size tarps did you use? It would be a good project for Scouts. Just bought a 9m x 5m waxed canvas tarp ( heavyweight 540 gsm). I have used the ‘pattern’ from Wildwood Wisdom by Ellsworth Jaegar to create a North American styled Tipi. Having collected about 14 Balsam Fir poles, we hope to assemble the tipi in the woods next week. 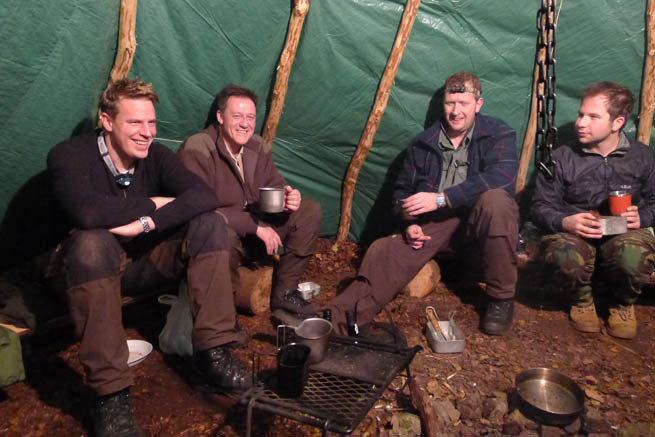 If you want to buy a tipi ‘proper’ I think you could be looking at around £1000. My version will cost about £250. The waxed canvas is superb and should last well…. Inspirations for the ‘mini project’ have come from many sources but this article has also been very useful. Very interesting. Please send me some photos of the finished article. I suspect it will look great! We often use a parachute for this type of shelter. One option in that case is to take a rope from the apex of the shelter and throw it over a tree branch. No poles needed. Very quick to set up. Any issues with smoke are much improved by using a firebox. What knots / lashings recommended for the tripod? Was it necessary to bury the base of the poles at all? Were any of the poles (naturally) forked at the top? Only 3 or 4 poles need to be lashed. The others can be laid over the basic structure. While you could go to the extent of a sheer lashing, it’s not at all necessary for this structure. You just need to encourage the main poles to stay together while erecting the shelter. A clove hitch or constrictor knot is a good way to start things off then wrap the cord around several times and finish off with similar or a few half hitches. The german boyscouts are using since 1929 a black cotton tent they call Kohte. There are today some silly variations on the market, but the original is constructed with 4 equal parts which are connected like the back entrance of a Landrover Defender soft top with loops instead of buttons. They also have buttons at the basic line next to the earth. Which allowes options for smaller and bigger tent constructions in the system. The original has 285 g/m2 cotton fabric and at the base line a down hanging inner stripe of 25 cm protecting against wind coming in. You can by that for 500 € brandnew. The standard size is portable in its 4 parts from 4 persons equipped with military cotton equiptment. The size is comfortable for 4 adult persons but you can press up to 8 boys between 12 and 16 years including 2 adult leaders in. Because in some books were wrong instructions most boy scouts construct today the tent in a wrong way by hanging it on a tripod or two pole sissors. Correct is to knot a cross in the fire hole and to press with to poles the tent up, what is storm resistent and allowes shorter and lighter poles. In that construction you need 2 poles, 2 sticks for the cross in the chimney and 8 pegs, all handmade in the woods, some natural cordage (canabis) and a 1 meter cooking chane (prolonged with cordage) with hook for large pot or kirtley kettle. Instead of normal international boy scout groops the germans start with 12 years old boys and have age mixed groops, so they can carry an old woodsman military surplus equiptment. They normaly do hiking tours with only one patrol and do not use a campside a second night. The rest of equiptment is a military poncho especially for person nr 5 to 8 and what you recommend in your low budged tips, but using a propper sleeping bag, often with cotton bivibag. The Pfadfinder – Kohte is the equiptment result of 100 years bushcraft tradition of german scout and Wandervogel groops and for hiking bushcrafting young groops the best option, because if the leader gives out a strikt packing list, wich contains one tube of toothpaste for the groop, one little axe, one little frame saw for the group, but knive, canteen and german mess kit for the single person and so on, the groop can use very cheap and heavy (duty) equiptment. That ceeps the costs low and educates to concentrate in the essentials. 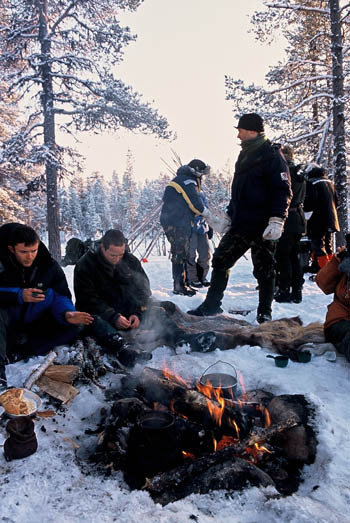 Harder groops use simply woolen blankets instead of sleeping bags because the lavuu – kotta allowes to heat the tent up to sauna level even in winter conditions. German scouts would hate everybody who makes a drunken plastic party in that tent. But there is nothing against, if oliv green bushcrafters with military equiptment or old woodsman stile opinions would participate in that may be best invention which came from Germany! I never tried it, but may bee that it is possible to take 4 buildingside tarps, construct that Kohte on an rektangular ground, pull the 4 middel points a bit out and fold away the corners on top exactly at the metal loops so that you can knot diagonal a cross in the rectangular chimney hole. Than you could perhaps construct that tent with 4 tarps.– with 2 poles, 2 chimneystics, 8 pegs and tension on the fabric coat instead of collecting so many poles like in your construction! You should look the cut of the pfadfinder – Kohte up in internet or by visiting or inviting some german boy scouts, or buying one for your school and try to reconstruct the cotton original with building side or larger lightweight tarps. If you can stich extra loops for the correct size of the chimney surely that works, but may be also with existing material without changing the stiched loops or metal holes. That would be a very interesting project, for what in the moment unfortunately I have no time and space, because i am traveling too much. I found a good video, that shoes you, how to construct that tent in a propper and very fast way. I prefere to put the poles inside, pressing from underneath against the cross on top of the tent, but the way in the video is also ok. 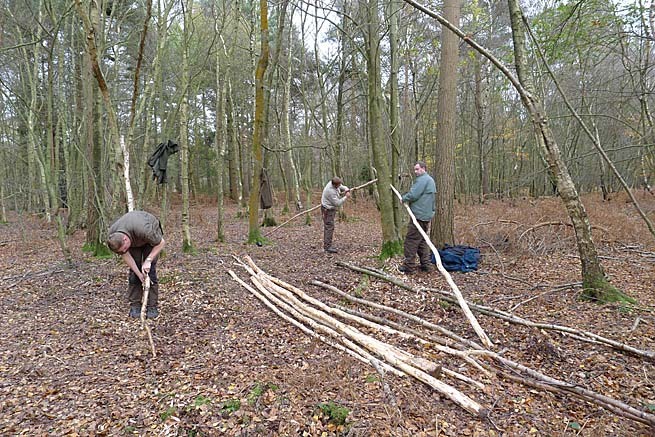 In the forest you cut poles and pegs from standing dead wood. “Kohtenaufbau auf Zeit” – In the time, the two boys are inside the tent, and nothing happens outside, they are connecting the four parts propperly and wind proof. Actually Marcus, the poles are better cut green and debarked if you are going to be using the camp repeatedly. Hi Keith, about 4 metres/12ft. Does anyone have a building instruction for a One-man-tipi? 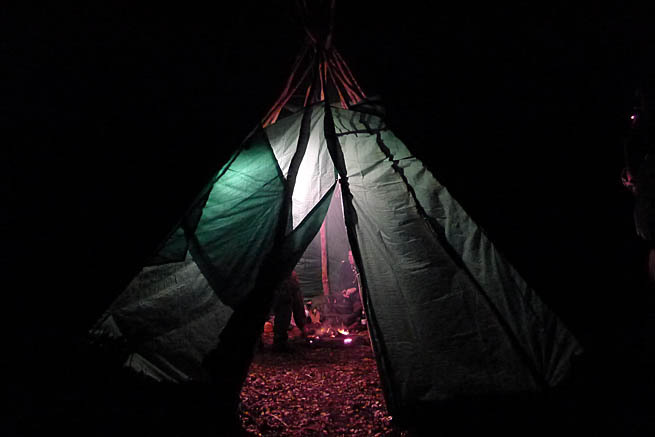 I would love to integrate a tipi into my normal gear but most tipis are designed for a whole group of people.